Climate changes and energy crisis accelerate the exploration on traditional energy production and new alternative energy sources. Biofuels are important because they could replace petroleum fuels. With high yield production, wide distribution and dramatically high tolerance to biotic and abiotic stress, Miscanthus sinensis was considered as one of the most potential energy plants in China. As a relatively new biomass plant, its background knowledge in physiological, pretreatment and genetic investigation is scarce. This review aimed at physiological and characteristics description, as well as pretreatment for ethanol production and genetic improvement of M. sinensis. The achievements of genomic and epigenomic research programs in other plants are of great help to better understand the nature of this promising biomass crop species in China. Meanwhile further researches on deconstruction enzymes, genetics and breeding would accelerate the application of M. sinensis, with higher yield, better quality, and wider adaption. Miscanthus sinensis, Biomass Crop, Morphology, Physiology, Characteristic for High Potential, Treatment Process, Genetic Improvement. The energy crisis that was caused by climate changes and energy conservation accelerates the exploration in traditional energy production and new renewable energy sources . In 2007, China’s net import of oil has reached to 186 million tons, accounting for 49.6% of its total oil demand . Biofuel is a renewable energy source produced from natural plant materials, such as bioethanol from Miscanthus, grain or sugarcane and biodiesel from vegetable oils or animal fats . Based on production technologies, biofuels were categorized into to four generations: first (those produced primarily from food crops such as grains, sugar beets and oil seeds), second (those produced from the non-food biomasses including cereal straw, bagasse, forest residues, and purpose-grown energy crops such as vegetative grasses and short-rotation forests), third and fourth generations . The second and third generation biofuels are also called advanced biofuels, which are mainly made from non-food crops and algae . However, considering the high value of food crops and potential stress of lands, first generation biofuels appear unsustainable . Before 2004, corn and wheat are used as the main feedstock to produce ethanol in China . Because of the limited grain feedstock, urban air pollution, carbon sequestration, and expansion on food security, the secondgeneration biofuels have been considered as one of the most potential biofuels in China in the future . Bioethanol and biodiesel are two global transportation fuel derived from biomass. The cost of feedstock, conversion process, scale of production and region mainly affected biofuel production costs. For biofuels, the cost of feedstock is a major component of overall costs. Considering biofuel price exclusive of taxes, bioethanol from lignocellulose will be estimated as most promising alternative compared with oil . To satisfy current and future demands, ethanol production from lignocellulosic biomass fermentation is a viable option that does not compete with the food supply. Due to its low cost and high availability, lignocellulosic biomass provides a significant proportion of raw materials for bioethanol production in the long term . In China, industrial biomass can be grown from types of plants, including Miscanthus, sweet sorghum, cassava, and sugarcane . About 6.67 million ha reclaimable lands could be used as energy crops lands in China . Currently studied potential biomass species could survive in these extreme lands including sweet sorghum (planted in North of China) and cassava (planted in South of China). In China, M. sinensis is widely distributed from Hainan to Heilongjiang, covering latitudes between 18º39'N and 45º22'N, and within an altitude ranging from 3 m to 2109 m. A variety of wild Miscanthus species in China have contributed fundamental information for further breeding and genetic improvements. As one of the top nine potential bio-energy grasses, Miscanthus has shown its potential for future renewable secondgeneration bio-energy . The data from field trials on Miscanthus has shown high energy production from many locations in Europe [11,12]. There are three Miscanthus species with a high potential of biomass production, Miscanthus × giganteus (M × giganteus), M. sinensis and Miscanthus sacchariflorus ( M. sacchariflorus). M × giganteus has been extensively studied and popularly used for biomass production. However, M × giganteus, widely used in Europe and North America, was derived from a single clone of the spontaneous triploid hybrid between diploid M. sinensis and allotetraploid M. sacchariflorus . Thus the genetic basis of M. × giganteus is very narrow, which is difficult to be broadened due to its triploid sterility. Genetic improvement of M. × giganteus greatly depends on both M. sinensis and M. sacchariflorus . M. sinensis is a perennial C4 photosynthetic and rhizomatous grass, with high yield potential, high water use efficiency, low need of fertilizer, and high resistance to extreme environments . Because of its high productivity compared to other C4 crops within growing season, M. sinensis is regarded as a promising crop for feedstock of biomass and alternative bio-fuel in China . Though Miscanthus has been advocated as potential second-generation biofuel feedstock by Chinese government, limited information is available on genetics and conversion process of Miscanthus. 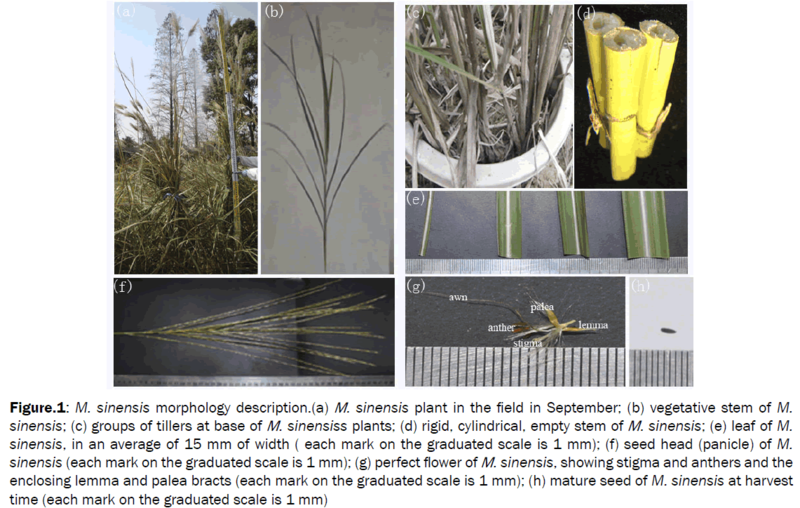 This review would like to focus on the available M. sinensis studies for a better understanding of the nature of this promising biomass crop species in China. Underground stems extend short and thick rhizomes (5-10 cm), and sprout new roots on active nodes to form new tillers (Figure 1c) . An aboveground stem is rigid, cylindrical, unbranched, and mostly hollow (Figure 1d) . In our field trial (conducted in Wuhan, China), M. sinensis could reach up to 3.35 m in height (Figure 1a and 1b) , higher than that in Japan and Europe, which are 2 m and 2.3 m, respectively [18-21]. Individual leaf blades of M. sinensis are 100 cm long on average and range from 2 mm to 20 mm in width . Ligules arising from sheath are 1-2 mm (Figure 1d) [23,24]. In total, about 12-14 leaves per culm grew from the ground until the flag leaf appeared near the panicle. The leaf area index of M. sinensis contains a high value, and reaches to a peak of 3.9 ± 0.6 [25,26]. Each tiller precisely produces only one panicle at the top of the stem above the flag leaf. M. sinensis genotypes planted in Wuhan start heading at the 120th to 250th day after sprouting in March, while flowering date is mostly from late autumn to early winter over a long time. An individual flower contains 2 stigma and 5 anthers. Each flower contains an awn arising at the upper lemma of 6-12 mm (Figure 1e and 1f). Mature seeds at harvest time are still flanked by lemma and palea adhering to the caryopsis, which contain seedling embryo, and the caryopsis is about 4 mm in length (Figure 1h). M. sinensis is regarded as one of the potential bio-fuel crops, which may be partly due to its relatively high dry-matter yield compared to other plants and primarily benefits from high efficiency of C4 photosynthesis [25,26]. The mean weight of underground dry-matter is 12.9 t ha-1 in Kawatabi, Japan . According to our field trials, the aboveground biomass yield in China is estimated to range from 0.1 to 38.5 t ha-1. Under field conditions without irrigation and fertilization, the aboveground biomass from Guangdong province of China yielded up to 38.5 t ha-1, which was dramatically higher than that of 22.4 t ha-1 planted in Europe and 12.7 t ha-1 planted in the Mount Aso region of Japan [18,28]. Hence, with high dry-matter yield, M. sinensis could play a better role as a potential bio-fuel crop in China locally. M. sinensis possesses high tolerance to extreme environments in natural or anthropogenic systems including volcanic and coastal areas in acid-sulfate soil with poor nutrient availability, especially a phosphorus (P) deficiency [22,30]. Yoshii clarified the first invader plants in the volcano and reported that the volcanic regions’ restoration plants usually included M. sinensis, where a highcontent of toxic gases and sulfate was always found around acid soil craters without other necessary nutrients for herbaceous investigation. Compared to other Miscanthus species, M. sinensis could possess a high tolerance to extreme environments, which shows a high potential in breeding new hybrids of good tolerance to abiotic stress. As significant changes of PPDK and Rubisco proteins in C4 pathway could contribute to the cold-tolerance, M. sinensis increases rubisco content to get used to low growth temperatures [31,32]. And within two years of clearing open areas of a cold temperate region in Japan, M. sinensis could survive to sprout . Farell et al. demonstrated that when exposed to frost temperatures of -2°C, -4°C, -6°C, -8°C, and -10°C for 3 hours, only M. sinensis hybrid Sin-H9 could tolerate frost with lethal temperatures of 50% death (LT50) at -9.3°C, while other investigated genotypes were all killed. Upon investigating the LT50 value in five Miscanthus species, Clifton-Brown found that M. sinensis had a much lower LT50 of -6.5°C than that of M. × giganteus and M. sacchraflorus at -3.4°C [35-36]. M. sinensis also shows good performance when exposed to physiological pressure. In artificially simulated high-salt and drought conditions, M. sinensis could still survive with the NaCl concentration of 18 g/L and PEG concentration of 25% (W/W) . Clifton-Brown et al. examined the response of water stress by regulating the amounts of water supply. They found that M. sinensis had a strong tolerance to drought and low demands for water and nutrients, as it has a flexible water-saving strategy to maintain green leaf area, by reducing direct response of leaf to drying soil at water-deficient period [38,39]. M. sinensis’ strong resistance to drought, cold, and poor planting environments on marginal lands makes it a good choice for domestication . In the future, efforts need to be made to identify potential linked markers for morphology, and physiology such as tolerance in nature, which would accelerate the researches on screening, selecting, and breeding in M. sinensis. The rhizomes are tuft-forming with high shoot densities, which contribute significantly to prevent water and soil erosion . M. sinensis rhizomes branched 3 times per year on average, and more than half of the new tillers would successfully develop aboveground shoots during the same year . M. sinensis has high content of holocellulose (72.5 ODW, short for Over-Dried Weight) and α-cellulose (42.2 ODW) content, low ash (0.7 ODW) content and low Klason lignin (19.9 ODW) content [41,42]. Dry stem biomass contained 85-89% of cell wall of M. sinensis tested, while cellulose content in cell wall was 32-55% across samples with significant variations . Lignin confers integrity and structural rigidity on the plant cell and shows the most significant resistance against pretreatment to cellulosic ethanol . The lignin content across all M. sinensis samples tested was 22-24%. However, lignin content in the M. × giganteus was up to 28% . With relatively low lignin content within limited undigested molecular mixture, M. sinensis needs lower energy input for cellulose degradation to ethanol, which provides benefits in pretreatment. Sugar content of M. sinensis was more than 62%, which mainly consisted of pentose (22.4%) and hexose (40.2%) . Total content of sugar is similar to other major sources of lignocellulosic biomass, such as wheat (69%), corn stover (65%), and rice (63%), indicating its big potential for biomass crops [46-48]. Before cellulose and hemicellulose are converted to ethanol, they require chemical and physical pretreatments followed by enzymatic breakdown of the molecules . A number of alternative systems of pulp production have been investigated and proposed by the scientific community . Compared with sugary and starchy as raw material for bioethanol production, more complex pretreatment and hydrolysis technology are demanded for lignocellulose-based biomass. In fact, lignocellulose pretreatment is the main economic costs in conversion of lignocellulose to ethanol . Once the raw material has been pretreated, lignocellulose must be hydrolyzed to liberate fermentable sugars. The goal of pretreatment is to break down the lignin structure and disrupt the crystalline structure of cellulose to make it accessible to hydrolysis for conversion to fuels [51,52]. Pretreatment technologies of biomass conversion to lignocellulose include three major processes: chemical, biological, and physical . Since different lignocellulosic materials have different physical and chemical properties, suitable pretreatment technologies should be adopted for each raw material. The pretreatment of M. sinensis is currently consisted of chemical, physical-chemical, and biological pretreatments. Acid pretreatment could solubilize the hemicellulosic fraction of M. sinesis and make the cellulose in plant cells more accessible to enzymes . Aboveground M. sinensis stems could be subjected to acid delignification at atmospheric pressure. Under condition of pulping for 75 min with liquor containing 87.8% of formic acid and 0.09 % of HCl, pulp yield relative to dry M. sinensis was 46%, while RKL was 3% . Compared to high chemical concentration of 1% H2SO4, 0.25% H2SO4 showed a better calibration correlation, which makes a larger variation in sugar yields . An alkali-based treatment is another useful process to study ethanol production on M. sinensis. Iglesias and colleagues studied the delignification of M. sinensis by alkaline treatment with NaOH solution. In the optimal condition of dissolved lignin/ weight losses at 0.4, pulp yield about 60% of the lignin . In one step by alkaline pulping, preliminary results have shown that M. sinensis can be efficiently delignificated to low level (kappa numbers around 25), with 56% pulp yield . Optimized NaOH pretreatment with Thermotogaelfi enzyme hydrolysis resulted in 77% delignification, a cellulose yield of more than 95% and 44% hydrolysis of hemicellulose . Besides these methods, other pretreatment are explored to enhance the digestibility of cellulose of M. sinensis. Results of thermal, oxidative, lime, liquid hot water, and a combination of ammonia and carbon dioxide pretreatments show significant potential for the digestibility . M. × giganteus, catalytic steam gasification provided good production with about 1.7 m3 kg−1daf of gas, containing 50% of H2 . Murnen and colleagues  optimized ammonia fiber expansion pretreatments and enzymatic hydrolysis of M. × giganteus to fermentable sugars, which achieved approximately 96% glucan and 81% xylan conversions. Indeed, all the progress in M. × giganteus treatment suggests that further researches should be done to enable M. sinensis pretreatments for higher pulp production. Microwave-based pretreatment can be considered as a physical-chemical process since both thermal and non-thermal affects are often involved. Microwave-assisted ammonium hydroxide followed by phosphoric acid treatments were used to release monomeric sugars from M. sinensis. The two-stage pretreatment, treatment with NH4OH at 120 °C for 15 min followed by treatment with H3PO4 at 140°C for 30 min, impressively provided total monomeric sugar yields of 71.6 g/100 g dried biomass . Hot water does not require addition of chemicals, lessen the need for expensive reactors, avoid catalyst recycle, and overcome neutralization costs. A hot water pretreatment of M. sinensis samples was demonstrated at a lower temperature at 121°C for 20 min in an autoclave. It showed larger variation in sugar yields than chemical pretreatments . Biological pretreatments always employ microbial and enzymatic pretreatments [51,62]. As the unique microorganism that is able to remove lignin from lignocellulosic plant litter, fungi are always explored to upgrade lignocellulosic materials for feed and paper applications. Till then, many fungi colonies have been selected for further bioconversion studies. As a dominant component of microfungal assemblages on M. sinensis leaves in the field, N. sphaerica had been evaluated for bioconversion of M. sinensi . By collecting fungi associated with decaying Miscanthus plants in nature, about 950 fungal colonies were randomly selected out of 4,560 micro-well colonies. The genus of Sordariomycetes and Dothideomycetes were indicated as the most promising to be used as bioconversion species . An evaluation of biological pretreatment of litter-decomposing fungi to remove lignin from leaves of M. sinensis was performed under pure culture conditions; 12 different fungi species could cause the mass loss of leaves ranged from 4.7% to 43.1% of the origin leaf mass . Results from recent studies have shown that lignin degradation by white-rot fungi mainly depends on the features of lignin degrading enzymes such as peroxidases and laccases . Though several white-rot fungi species have been examined on different lignocellulosic biomass showing high delignification efficiency, Phanerochaetechrysosporium, Trametesversicolor have been examined most potential within Miscanthus . Trametesversicolor could cause 43.1% and 49.5% mass loss of lignin and total carbohydrates, respectively . In general, biological pretreatment offers advantages such as no chemicals requirement, low cost, and low energy input . However, biological methods develop low hydrolysis rate compared to other technologies . To improve the hydrolysis rate of biological pretreatment for M. sinensis, studies to divide more basidionycetes fungi colonies with ability to delignify M. sinensis efficiently should be evaluated. Taxonomically, Miscanthus belongs to Saccharineae, Andropogoneae, and Panicoidae in the family of Poaceae and could be classified into four groups of Triarrhena, Eu Miscanthus, Kariyasua, and Diandra . M. sinensis is in PACCAD clade and belongs to Eu Miscanthus [69,70]. It is classified to a core group with M. floridulus, M. sacchariflorus, M. sinensis subsp. condensatus, M. oligostachyus, and M. transmorrisonensis . M. sinensis is a diploid (tetraploid sometimes in nature) and has a basal set of 19 chromosomes and genome size of 5.5 pg [70-73]. Considering the origin of M. × giganteus, it has been suggested as the result of hybridization between M. sinensis and M. sacchariflorus [13,59,74]. Rayburn analyzed the three species by cytometry and stomatal cell and hypothesized that M. sinensis provided one genome for M. × giganteus, while M. sacchariflorus contributed two genomes [72,73]. However, the hybrid origin is still confusing, more molecular and genetic research should be explored to dissect their genome evolution. Although M. × giganteus produces a high yield, as a kind of sterile grass, it strongly depends on M. sinensis for genetic research to provide high quality and performance. Hence, M. sinensis germplasm is an important resource to broaden genetic basis for successful breeding research [93,94]. Genetic improvement of M. sinensis primarily focused on biomass yield and environmental stress tolerance. Conventional plant breeding technology across different populations results in open hybrid varieties and leads to more changes in gene expression, which may also affect agricultural production. Preliminary studies on M. sinensis of tetraploid forms in field experiments have carried out rich lucrative genotypes with greater dry biomass weight, higher cellulose content, and higher resistance to extreme environments in comparison to the controls [21,22]. For example, inbred generation of M. sinensis and M. lutariooriparius could successfully produce several hybrids with greater cellulose content and lower lignin content, which is of tremendous impact for bio-fuel production. Conventional breeding researches on M. sinensis have produced hybrids of high performance. In China, Miscanthus’ interspecific crosses were performed. They constructed 24 interspecific combinations, 2 backcross populations, 3 F1 sib-mating populations, and 1 recurrent crossing population. The elite F1 hybrid lines captured a higher cellulose and lower lignin content, which are 48.93% and 12.30%, respectively . In Europe, several hybrids were made from two M. sinensis populations with a wider temperature ranges tolerance. For example, sin-H6 and sin-H9 showed higher tolerance to suboptimal temperatures and late frost events . Moreover, sin-H9 had higher thermal response rates with a Tb of 6.0°C and frost tolerance with a lethal temperature of -9.3 °C lower than M. × giganteus . As one of the new leading candidates to meet biomass demand for future power generation and bio-fuels production, M. sinensis needs further genetic improvement using both conventional breeding and modern biotechnical approaches. Advanced breeding reinforces the genetic bottlenecks. from related crops, such as corn, sorghum, and sugarcane with a rich genomic database, may accelerate breeding procedures. Based on 57 SSR markers derived from Brachypodium distachyon, Zhao at al. clustered 21 genotypes of M. sinensis into three distinct groups . Molecular markers provide efficient introgression traits within linked markers . This procedure will be particularly important in M. sinensis as many of the desired traits are expressed only after 2-3 years . Once the robust associations between these molecular markers and phenotypes have been established, it will be convenient to select desired offspring from a cross in further research. QTL strategy could be used to investigate the relationship between quantitative traits and loci based on linkage maps, which were usually constructed by molecular markers such as RAPD, SNP, and SSR markers. QTL maps for plant height stem diameter, yield, and combustion quality parameters have been identified in a single M. sinensis cross [82-85, 87]. Though there is a lack of sufficient sequence data for M. sinensis, QTL analysis may be an alternative tool to sequence target regions of candidate genes with known functions [87,88]. Considering the preliminary researches on M. sinensis, it could be extended to additional populations, environments and traits. QTLs mapped in other grasses can inform a candidate locus in M. sinensis. For example, testing the genetic origins of loci controlling shattering among other model organisms, functions as an abscission layer in millet, seed dispersal in sorghum and maize, and seed shedding in rice could improve development of identification of markers associated with related traits within M. sinensis . Screening M. sinensis genotypes in raw data of field trials could optimize biomass yield and quality. As the biomass yield and quality of a particular genotype of one year growth does not always correlated to that measured in the following year, so the identification of the most suitable genotypes requires at least two years. Characteristics such as heading date/flowering time and senescence rate are critical for reproductive success and for optimizing yield and quality. It is essential to determine genotype growth characteristics by measuring plant height shoot density, stem diameter, flowering time, etc. Expensive and intensive observations in agronomy should be conducted to investigate screening for new valuable, novel genotypes with high yield, good quality, and wide adaptation. The available crop genome sequences can dramatically advance both the theory and application of M. sinensis breeding. Whole genomes sequenced in several crops including rice, maize, and sorghum have been characterized. The sequences have opened the door for large-scale transcriptomics and proteomics studies, which has proved to be useful in Miscanthus breeding studies [87,90,91]. The sequence data can be used to study the origin of genes and gene families, track rates of sequence divergence over time, and provide hints about how genes evolve and generate products with novel biological properties . However, Miscanthus genome sequencing is still in its infancy due to its large and highly heterozygous genome. Nevertheless, physical mapping and sequencing of the M. sinensis genome have been conducted by several research institutions. A high resolution genetic mapping by genotyping-by-sequencing (GBS) was constructed recently. This genetic map enables informed deployment of the wealth of existing genomic resources of other species to the improvement of Miscanthus as a high biomass energy crop . All these efforts develop the needed background and tools for sequencing the diploid Miscanthus genomes and provide excellent tools for unfolding Miscanthus evolutionary studies and for optimizing breeding practices. This is a long-term, milestone-based strategy that delivers products and tools while working towards crop improvement, both qualitatively and quantitatively. M. sinensis is one of the leading bio-fuel crops with growing importance in the world. Studies on agronomy and taxonomy have shed light on its potential usage as a high-yield biomass. As the progenitor of grass biofuel, M. sinensisis is central to Miscanthus breeding improvement, and contributes two genomes to M. ×giganteus. The studies of M. sinensis in China are in the early stages and mainly focus on field trials for several years, accumulating knowledge of its basic biology. Also, germplasm collections are essential to conserve biodiversity in accelerating breeding process, without strong genetic diversity. As the main economic costs in conversion of M. sinensis to ethanol, more low cost and efficient pretreatment methods should be improved in the future, especially the biological conversion processes. Enzymes that deconstructed cell wall efficiently would contribute better pretreatment property of M. sinensis. As a Miscanthus progenitor, M. sinensis should be subjected to in-depth studies to evaluate the structural, functional, and regulatory polymorphisms adapting it to environmental stress. More efforts should be made to select new M. sinensis hybrids, which are resistant to leaf senescence and drought, with no significant root biomass reduction, from the cross pollination of M. sinensis genotypes . It might significantly accelerate research of both speciation and adaption processes to stressful and changing environments, once associations between genomic and epigenomic diversities are established. Transgenic technology on M. sinensis could target on facilitating biomass dry-matter yield and enabling colonization of extreme environments. Higher yield must be assumed priority, minimizing labor input and land needs. Advanced technologies could focus on important adaptive genes and enable their active introgression for genetic reinforcement to cultivate M. sinensis with good quality and quantity. Bollen J et al. An integrated assessment of climate change, air pollution, and energy security policy. Energy Policy. 2010;38:4021-4030. NSBC. China energy statistic year book. 2007; Beijing: China Statistic Press. Demirbas A. Political, economic and environmental impacts of biofuels: Areview. Applied Energy. 2009; 86:S108-S117. Demirbas A. Competitive liquid biofuels from biomass. Applied Energy. 2011; 88:17-28. Demirbas MF.Biofuels from algae for sustainable development. Applied Energy. 2011; 88:3473-3480. GnansounouE et al. Promoting bioethanl production through clean development mechanism: findings and lessons learnt from ASIATIC project.Proceedings of the 7th IAEE European energy conference. 2005;Bergen, Norway. The Royal Society. Sustainable biofuels: prospects and challenges. 2008;London, UK. Qiu Het al.Bioethanol development in China and the potential impacts on its agricultural economy. Applied Energy.2010; 87:76-83. Agriculture Mo. Development planning of China's bioenergy industry (2007). Lewandowskia I et al. The development and current status of perennial rhizomatous grasses as energy crops in the US and Europe. Biomass and Bioenergy. (2003); 25:335-361. Heaton E et al. Miscanthus for renewable energy generation: European union experience and projections for Illinois. Mitigation Adaptation Strateg Glob Chang. (2004);9:433-451. Heaton EA et al. Meeting US biofuel goals with less land: the potential of Miscanthus. Global Change Biology. 2004;14:2000-2014. Hodkinson TRet al. The use of dna sequencing (ITS and trnL-F), AFLP, and fluorescent in situ hybridization to study allopolyploid Miscanthus (Poaceae). American Journal of Botany. 2002; 89:279-286. Jørgensen U et al. Light interception and dry matter conversion efficiency of Miscanthus genotypes estimated from spectral reflectance measurements. New Phytologist. 2003;157:263-70. Heaton EAet al. Miscanthus: A promising biomass crop. Advances in Botanical Research. 2010; 56:75-137. Shumny VKet al.A new variety of Chinese silver grass (Miscanthus sinensis Anderss. ): A promising source of cellulose-containing raw material. Advances in Bioscience and Biotechnology. 2010;1:167-170. Schmid T. Miscanthus plant named 'Tiger tail'. 2009; US. Clifton-Brown JCet al.Performance of 15 Miscanthus genotypes at five sites in Europe. Agronomy Journal. 2001;93:1013-1019. Kobayashi K.Studies on the growth and maintenance of patch of Miscanthus sinensis Andress: Formation process of the patch and its ecological characteristics in a warm region. Journal of the Japanese Society of Grassland Science. 1981;27:71-8. Tang Y-H et al.Fluctuation of photosynthetic photon flux density within a Miscanthus sinensis canopy. Ecological Research .1988;3:253-66. Mutoh N et al. Species diversity and primary productivity in Miscanthus sinensis grasslands. Journal of Plant Research. 1985;98:159-170. Hirata M et al. Evaluation of forest grazing as a management practice to utilize and control Miscanthus sinensis in a young tree plantation in southern Kyushu. Japan. Grassland Science. 2007;53:181-191. Bouton JH. Molecular breeding of switchgrass for use as a biofuel crop. Current Opinion in Genetics and Development. 2007; 17:553-558. Smith C. Invasive exotic plants of north Carolina. In: Transportation. NCDo, 2008; editor. Raleigh, NC. Michel Ret al.Catalytic steam gasification of Miscanthus× giganteus in fluidisD, Bued bed reactor on olivine based catalysts. Fuel Process Technol.2011; 92:1169-1177. Vargas LA et al. Estimation of leaf area index, light interception and biomass accumulation of Miscanthus sinensis 'Goliath' from radiation measurements. Biomass and Bioenergy. 2002; 22:1-14. Yano N and Kayama R. Underground in: ecological studies in Japanese grasslands with special reference to the IBP area. 1975;Tokyo: University of Tokyo Press. Stewart JRet al. The ecology and agronomy of Miscanthus sinensis, a species important to bioenergy crop development, in its native range in Japan: a review. GCB Bioenergy. 2009; 1:126-153. Himken M et al. Cultivation of Miscanthus under Western European conditions: seasonal changes in dry matter production, nutrient uptake and remobilization. Plant and Soil. 1997;189:117-126. An GH et al. Community structure of arbuscular mycorrhizal fungi associated with pioneer grass species Miscanthus sinensis in acid sulfate soils: Habitat segregation along pH gradients. Soil Science and Plant Nutrition. 2008;54:517-528. Sage RF and Kubin DS. The temperature response of C3 and C4 photosynthesis. Plant, Cell and Environment. 2007; 30:1086-1106. Naidu SL et al. Cold tolerance of C4 photosynthesis in Miscanthus×giganteus: adaptation in amounts and sequence of C4 photosynthetic enzymes. Plant Physiology. 2003; 132:1688-1697. Inoue T. Chronosequential change in a butterfly community after clear-cutting of deciduous forests in a cool temperate region of central Japan. Entomological Science. 2003; 6:151-163. Farrell AD et al. Genotypic variation in cold tolerance influences the yield of Miscanthus. Annals of Applied Biology. 2006;149:337-345. Clifton-Brown JC and Lewandowski I. Overwintering problems of newly established Miscanthus plantations can be overcome by identifying genotypes with improved rhizome cold tolerance. New Phytologist. 2000; 148:287-294. Chiang YC et al. Contrasting selection modes at the Adh1 locus in outcrossing Miscanthus sinensis vs. inbreeding Miscanthus condensatus (Poaceae). American Journal of Botany. 2003; 90:561-570. Jiao SY et al. Physiological responses of Miscanthus sinesis‘Morning Light’to PEG and NaCI Stress and their correlations analysis. Chinese Journal of Grassland. 2010;32:21-26. Clifton-Brown JC and Lewandowski I. Water use efficiency and biomasspartitioning of three different Miscanthus genotypes with limited and unlimited water supply. Annals of Botany. 2000; 86:191-200. Jørgensen U and Schelde K. Energy crop water and nutrient use efficiency. 2001; Prepared for The International Energy Agency,IEA Bioenergy Task 17,Danish Institute of Agricultural Sciences, Denmark. Sang T. Toward the domestication of lignocellulosic energy crops: Learning from food crop domestication. Journal of Integrative Plant Biology. 2011; 53:96-104. Ye D et al. Preparation and characterisation of methylcelluloses from Miscanthus sinensis. Carbohydrate Polymers. 2005;62:258-266. Serrano L et al. Miscanthus sinensis fractionation by different reagents. Chemical Engineering Journal. 2010;156:49-55. Lygin AVet al. Composition of cell wall phenolics and polysaccharides of the potential bioenergy crop –Miscanthus. GCB Bioenergy. 2011;3:333-345. Ralph J et al. Lignin-ferulate cross-links in grasses: active incorporation of ferulate polysaccharide esters into ryegrass lignins. Carbohydrate Research. 1995; 275:167-178. Yoshida Met al.Effects of cellulose crystallinity, hemicellulose, and lignin on the enzymatic hydrolysis of Miscanthus sinensis to monosaccharides. Biosci Biotechnol Biochem.2008; 72:805-810. Taniguchi M et al. Evaluation of pretreatment with Pleurotus ostreatus for enzymatic hydrolysis of rice straw. Journal of Bioscience and Bioengineering. 2005;100:637-43. Kim TH et al. Pretreatment of corn stover by aqueous ammonia. Bioresource Technology. 2003;90:39-47. Saha BC and Cotta MA. Ethanol production from alkaline peroxide pretreated enzymatically saccharified wheat straw. Biotechnology Progress. 2006;22:449-453. Rostrup-Nielsen JR. Making fuels from biomass. Science. 2005;308:1422-423. Hendriks ATWM and Zeeman G. Pretreatments to enhance the digestibility of lignocellulosic biomass. Bioresource Technology. 2009;100:10-18. Mosier Net al.Features of promising technologies for pretreatment of lignocellulosic biomass. Bioresource Technology. 2005;96:673-686. Lynd LRet al.How biotech can transform biofuels. Nat Biotech. 2008; 26:169-172. Balat M and Balat H. Progress in biodiesel processing. Applied Energy. 2010; 87:1815-135. Caridad R et al.Formic acid delignification of Miscanthus sinensis. Cell Chem Technol. 2004;38:235-244. Huang Jet al.A rapid and consistent near infrared spectroscopic assay for biomass enzymatic digestibility upon various physical and chemical pretreatments in Miscanthus. Bioresource Technology 2012; 121:274-281. Iglesias G et al. Soda pulping of Miscanthus sinensis. Effects of operational variables on pulp yield and lignin solubilization. Bioresource Technology. 1996;58:17-23. Bao M et al. Bleachable pulps by soda-anthraquinone cooking of Miscanthus sinensis. Rimpar: Centrales Agrar Rohstoff Mkt and Entwicklung Netzwerk. 1998.
de Vrije Tet al. Pretreatment of Miscanthus for hydrogen production by Thermotoga elfii. International Journal of Hydrogen Energy. 2002;27:1381-1390. Hodkinson TR et al. Characterization of a genetic resource collection for Misacanthus (Saccharinae, Andropogoneae, Poaceae)using AFLP and ISSR PCR. Annals of Botany. 2002;89:627-636. Murnen HK et al. Optimization of ammonia fiber expansion (AFEX) pretreatment and enzymatic hydrolysis of Miscanthus×giganteus to fermentable sugars. Biotechnology Progress. 2007;23:846-850. Boonmanumsin Pet al.Release of monomeric sugars fromMiscanthus sinensis by microwave-assisted ammonia and phosphoric acid treatments. Bioresource Technology. 2012;103:425-431. García-Cubero MT et al. Effect of ozonolysis pretreatment on enzymatic digestibility of wheat and rye straw. Bioresource Technology. 2009;100:1608-1613. Osono T. Decomposition of grass leaves by ligninolytic litter-decomposing fungi. Grassland Science. 2010; 56:31-36. Shrestha P et al.Systematic search for cultivatable fungi that best deconstruct cell walls of Miscanthus and sugarcane in the field. Applied and Environmental Microbiology. 2011; 77:5490-5504. Kumar P et al. Methods for Pretreatment of Lignocellulosic Biomass for Efficient Hydrolysis and Biofuel Production. Industrial and Engineering Chemistry Research. 2009;48:3713-3729. Alvira P et al. Pretreatment technologies for an efficient bioethanol production process based on enzymatic hydrolysis: A review. Bioresource Technology. 2010;101:4851-4861. Sun Y and Cheng J. Hydrolysis of lignocellulosic materials for ethanol production: a review. Bioresource Technology. 2002; 83:1-11. Greef J and Deuter M. Syntaxonomy of Miscanthus×giganteus GREEF et DEU. Angewandte Botanik. 1993; 67:87-90. Lawrence CJ and Walbot V. Translational genomics for bioenergy production from fuelstock grasses: Maize as the model species. Plant Cell. 2007;19:2091-2094. Adati S and Shiotani I. The cytotaxonomy of genus Miscanthus and its phylogenic status. Bulletin of the Faculty of Agriculture Mie University. 1962;25:1-24. Hodkinson T et al.Phylogenetics of Miscanthus, Saccharum and related genera (Saccharinae, Andropogoneae, Poaceae) based on DNA sequences from ITS nuclear ribosomal DNA and plastid trnL intron and trnL-F intergenic spacers. Journal of Plant Research. 2002;115:381-392. Rayburn AL et al. Genome size of three Miscanthus species. Plant Molecular Biology Reporter. 2008; 27:184-188. Nishiwaki Aet al.Discovery of natural Miscanthus (Poaceae) triploid plants in sympatric populations of Miscanthus sacchariflorus and Miscanthus sinensis in southern Japan. American Journal of Botany. 2011; 98:154-9. Lafferty J and Lelley T. Cytogenetic studies of different Miscanthus species with potential for agricultural use. Plant Breeding. 1994;113:246-249. Yi Z.Cross breeding and comparative test. 2011. Changsha. Antonio AFGet al. Comparison of RAPD, RFLP, AFLP and SSR markers for diversity studies in tropical maize inbred lines. Genetics and Molecular Biology. 2004; 27:579-588. Ma XFet al.High Resolution Genetic Mapping by Genome Sequencing Reveals Genome Duplication and Tetraploid Genetic Structure of the Diploid Miscanthus sinensis. 2012. PLoS ONE7:e33821. Atienza SA et al. Preliminary genetic linkage map of andlt;SMALLandgt;Miscanthus sinensisandlt;/SMALLandgt; with RAPD markers.Theoretical and Applied Genetics. 2002;105:946-952. Kim Cet al.SSR-based genetic maps of Miscanthus sinensis and M. sacchariflorus and their comparison to sorghum. Theoretical and Applied Genetics.2012;124:1325-1338. Zhou HF et al. Development of microsatellite markers for Miscanthus sinensis (Poaceae) and cross-amplification in other related species. American Journal of Botany. 2011; 98:e195-e7. Zhao H et al. Transferability of microsatellite markers from brachypodium distachyon to Miscanthus sinensis, a potential biomass crop F. Journal of Integrative Plant Biology. 2011;53:232-245. Bransby DIet al.Engineering Advantages, Challenges and Status of Grass Energy Crops,In: Mascia PN, Scheffran J, Widholm JM, ed. Plant Biotechnology for Sustainable Production of Energy and Co-products. SpringerBerlin Heidelberg. 2011; 125-154. Atienza SG et al. Identification of QTLs influencing agronomic traits in Miscanthus sinensis Anderss. I. Total height, flag-leaf height and stem diameter. Theoretical and Applied Genetics. 2003;107:123-129. Atienza SG et al. Identification of QTLs associated with yield and its components in Miscanthus sinensis Anderss. Euphytica. 2003;132:353-361. Atienza SG et al.Identification of QTLs influencing combustion quality in Miscanthus sinensis Anderss. II. Chlorine and potassium content. Theoretical and Applied Genetics. 2003;107:857-863. Atienza SG et al. Influencing combustion quality in Miscanthus sinensis Anderss. : identification of QTLs for calcium, phosphorus and sulphur content. Plant Breeding. 2003; 122:141-145. Atienza SG et al. Mapping QTLs controlling flowering date in Miscanthus sinensis Anderss. Cereal Res Commun. 2003;31:265-271. Hernández P et al. Microsatellites and RFLP probes from maize are efficient sources of molecular markers for the biomass energy crop Miscanthus. Theoretical and Applied Genetics. 2011; 102:616-622. Peng JHet al.Domestication quantitative trait loci in Triticum dicoccoides, the progenitor of wheat. Proceedings of the National Academy of Sciences. 2003;100:2489-2494. Tanksley SD and McCouch SR. Seed banks and molecular maps: unlocking genetic potential from the wild. Science. 1997; 277:1063-1066. Goff SAet al.A draft sequence of the rice genome (Oryza sativa L. ssp. japonica). 2002; Science296:92-100. Hancock J. Contributions of Domesticated Plant Studies to our Understanding of Plant Evolution. Annals of Botany. 2005;96:953-963.